Wonderful place. 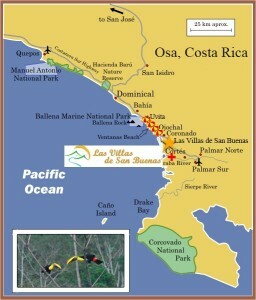 Being on the south eastern coast of the country, this area of Costa Rica is still pretty raw and undeveloped. Not going to find any high rise vacation resorts on these hills or beaches…..that is the beauty of it !!! This is a true escape from the hustle and bustle of the city, yet the house has all the modern conveniences and furnishings to keep you comfortable. The grounds are well kept and the flora and fauna right on and around the property will keep you occupied as you enjoy your morning coffees on one of the terraces. Once you leave the property you will find yourself traveling along the coast or through the hills between local villages that do support some modern amenities like a few supermarkets, restaurants, pharmacies, and gas stations….everything you need to feel comfortable…..But don’t expect to find any shopping malls, jewelry boutiques, night clubs etc…. This location is truly about taking a step back and experiencing the beauty and serenity of the land, the waters, and the local people. Perhaps one of the most relaxing trips we have taken. A true solace.